One of the largest concerns during a disaster situation is when to evacuate. Read more about evacuation dangers, how to prepare and most importantly – how to survive. In some types of disasters, like wildfires or hurricanes, evacuation orders may be issued by the local government. When this happens, some people devolve into a state of panic due to a complete lack of preparedness. 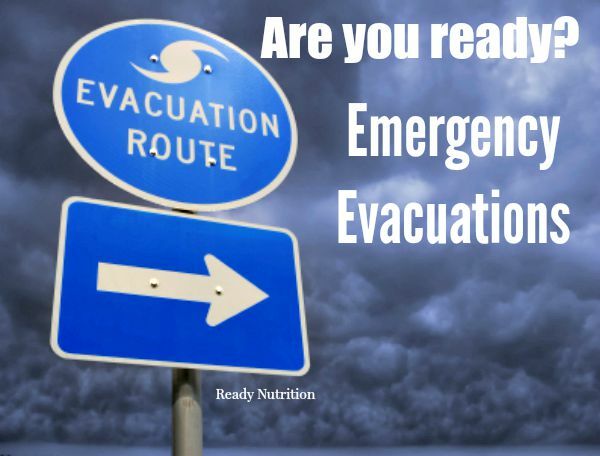 As discussed with examples of evacuation scenarios in my book, The Prepper’s Blueprint, if you have a plan in place for such an event, it can save stress, time, money, energy, and sometimes even a life. According to FEMA, evacuations occur far more frequently than we realize. A decisive plan of action should take into account the different variables of every situation. Create a family based emergency plan ahead of time so that everyone knows how to handle an emergency. Make your plan flexible enough to be workable during a wide variety of emergencies. The main priorities to keep in mind are shelter, fire, water, and food. Always have Plan A, B and C – and stay focused at the task at hand. The most important part of preparing is to have a well thought out plan. This plan should be in place before you ever evacuate. 4. Make sure you have extra navigational items. Keep items such as GPS, maps, and compasses in your vehicle evacuation supplies. This will ensure that you know where to go and how to get there. Don’t rely strictly on your vehicle’s built-in GPS. Have non-electric navigational items, too, in the event that your GPS stops working or that you have to set out on foot. Be sure to have a smaller road atlas that is easier to carry along with you. Evacuating from a home due to a fire or flood – If a home evacuation is in order, there is little time to collect belongings. Some experts say a person has 10 minutes or less to collect needed items. Prepare a list ahead of time of the items that would need to be taken such as photo albums, identification (birth certificates, social security cards, financial documents, wills/deeds, and medical insurance information), proof of address, as well as items for a 72 hour bag. Dividing the duties between family members will make this situation more efficient as well as make better use of time. Do you have the appropriate clothing and footwear for the terrain and climate conditions? Many evacuation shelters do not accept pets, so plan accordingly. Preparing a 72 hour pet kit will keep the pets as safe as possible. For some more tips on pet preparedness, click here. Evacuating from your home can be a very stressful situation, especially for those who are unprepared for this possibility. Following the correct protocols by having a family emergency plan, a decided meeting place, pre-established traveling routes and maps can help alleviate some of the tension in this situation. Here is a website to go on. I think there is a location by Northern CA close to NV border.